Hastily-written notes by Australian soldiers, departing for the first World War began washing up on Australia’s coast soon after the first troopships departed. 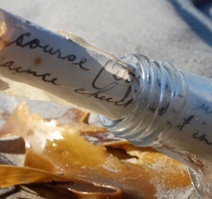 The soldier’s messages to family and friends were cast overboard in sealed bottles, tossed to the ocean in the hope the communications would make it to shore. Usually accompanied by a plea for the finder to deliver the bottle’s contents homeward, the uncensored, simple messages seem all the more poignant by their ingenious method of delivery. Bottles were found beached along Victoria’s and South Australia’s coast, as troopships commonly steamed westward for foreign ports, through Bass’ Strait and the Great Australian Bight. Bottle finders obligingly fetched washed-up bottles and delivered them usuall to their local newspapers, who took up the cause of publishing the soldier’s communications. In true bush-telegraph style, media outlets nationwide reprinted the messages for the benefit of family and friends. Some 313,814 Australian soldiers embarked during World War 1 and the collaboration between the Australian community in ensuring the delivery of soldier’s messages seems an intriguing example of pre and post-war social trust. The effective bottle-post and bush-telegraph delivery of messages from the sea during the war years was charitably supported by the more senior media, and their conflict as to what was best in the nation’s interest is not really known but may be obvious in uncensored reprinting of messages. Another striking feature of the bottle-post method was the accepted, maybe even expected use of news outlets as a primary form of contact, raising questions about the perceived role which media played in post-war community. Whilst bottle-messages were not uncommon to the sea-faring tradition of Australia they were usually confined to vessels in distress, or for mapping ocean currents. The curious question arises whether soldier’s messages from the sea during World War 1 was a collective signal of a nation’s formative distress, despite assurances from soldiers that everything was “ok”. This questions leads also to asking if the Australian public’s response in delivering bottle-messages was an individual or a national belief-system and practice. In October 1914 the HMAT Geelong steamed out of Hobart with the first Australians who answered the national role-call. 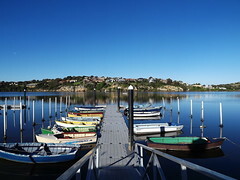 The vessel sailed westward for the war front through Bass’s Strait, conveying Tasmanian soldiers destined for Gallipolli after calling at Adelaide and Perth to add extra troops. 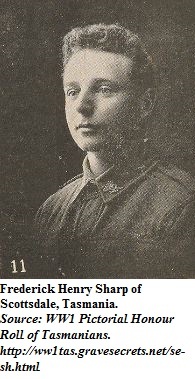 Private Frederick Henry Sharp, regimental #15 of the 12th Battalion,3rd infantry brigade leaned overboard HMAT Geelong two days out of port and cast a message overboard. 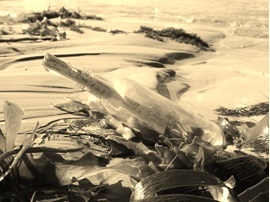 David Clarke found Sharp’s bottle four months later washed up at Nullawarre on Victoria’s south-west coast. Addressed simply to ‘Miss V. Carman of Ulverstone in Tasmania’ the message was marked “Transport Geelong, 22nd Oct 1914.’ Fred Sharp’s war service records at the National Archives of Australia states Sharp was a telegraph operator who signed up just a month before he sailed. Sharp advanced to the rank of corporal and served the full length of the war in Gallipoli and France, before his return in January of 1919. “Dear Mother, I am now writing you these few lines, and hope you get them all right. I am putting this note in this bottle, and going to throw it overboard. We are about 50 miles from shore. We know when we get somewhere near Warrnambool. We are having pretty good weather so far. If it keeps like this the whole of the voyage we will enjoy it. You can tell father that I am sorry I did not write to him, but I had not time for the last two or three days. It was nothing but running about everywhere getting things ready for inspection. Well, Mother, I will close my short letter, hoping you get it all right. Remember me to father, sisters and brothers. Some message bottles reached shore swiftly: Charles Humm of Warrnambool tossed a message overboard to his wife and children on the 2nd August 1916. It was found on the Port Willunga beach just 11 days later by A Macguire of Aldinga. However a message from Sapper T. E. Marks of the 1st Draft Reinforcements,Field Engineers to his mother Mrs M. Marks at Warrnambool wasn’t found till 19 months later and even then on a far-distant shore. Messages sent home usually offered reassurance that all was well, but understated threads of apprehension included sea-sickness, length of time at sea, destination arrival and conditions on board ship. On the 18th February 1916 as the transport “Ballarat” sailed past Warrnambool with reinforcements for the 14th Battalion, the husband of Mrs Nellie V. Brown of Kelp St tossed a message overboard to his wife. Private Jacob Brown #4447 wrote there were about 1500 men on board, and the first night out they slept on hummocks “packed in like sardines in a tin”. It was expected the vessel was sail direct for Colombo, Jacob told his wife in his letter found washed up on the 13th April at Discovery Bay. W Thomson of Cape Bridgewater forwarded the letter to the Warrnambool Standard to be passed on to Mrs Brown. A pencilled note on a brown paper bag was found in a bottle at Gaul’s Cave near Warrnambool on the 22nd Jan 1916 by H.W. Flaherty and W. Brown. The note was sent from the “Transport Demothenese” and cast overboard at Cape Otway on the 20th December 1915. A bottle cast overboard off Portland on Victoria’s south-coast by privates Griffiths, Lodge, Dodds, Bristow and Sherlock was found on the Anglesea beach on Monday 27th Nov 1916. The small piece of paper asked the finder to notify the Warrnambool Standard and said there were about 1700 troops aboard their vessel. 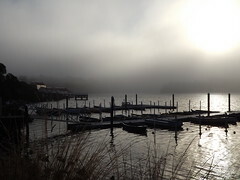 Their troopship had left at 6am. wrote Private Fotheringham, adding he “was not seasick”. Mrs Andrew Mitchell of South Warrnambool and Mrs W. McLennan of Western Reserve in Warrnambool received messages in November 1916 from Private W. McLennan and Private F. E Wilson of the 2nd Infantry Brigade, 21st Reinforcements, 5th Battalion A.I.F. “We are having a delightful trip, all the boys are happy” they reassured the women. Their message was cast overboard on the 4th October and found on the 19th November 1916 on the western beach about 3 miles out of Robe, by John Lea of ‘The Hermitage”. A letter from 18 ‘Warrnambool boys’ dated 16 March 1916 was cast overboard – “we don’t know where’ -but not found for another 18 months. The men – Cecil T. Harwood , W.F.R.Robinson, Harold Noonan, P.J. White, A. Anderson, R. Tecrett, W. Carter, Punch O’Keefe, J.F.Gleeson, R.P. Perrie, W.Dolan, L. Parkinson, G. Fitzgerald, D.Coleston, W. Rowe, S. Reed, T. Adams and B.Bell had departed Port Melbourne, at 12.30 on March 14 they wrote. 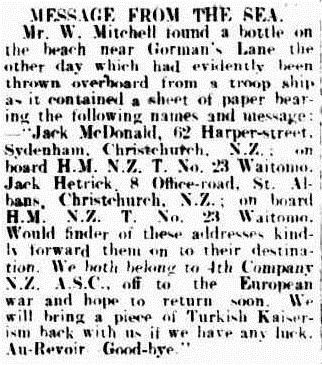 New Zealand papers also reprinted bottle messages including one found by W. Steere at Warrnambool late in 1916, from A.E Tremain of the 3rde N.Z Rifle Brigade. Tremain senior forwarded copies of the original news-clipping to his son at the front in the hope they might reach him. On the 6th Jan 1917 A. E Tremain wrote from the war-front to Steere, to thank him for delivering his message. Not all the messages reached shore in a readable condition. William Maloney found a bottle washed ashore at Gorman’s Lane below Tower Hill in January of 1917 but its contents were water damaged. Sometimes objects accompanied the bottled messages: Private R Lock placed a small leather kanagaroo stamped with the words “Australia Day” in a bottle, along with a message written on Christmas Day 1915. Lock’s letter, printed in March 1916 also said a girl, masquerading as a soldier and a sailor had been found on a troopship. The girl was prosecuted in March 1916, the Standard later wrote. The ‘bottle post’ delivered thousands of messages from the sea – and messages were often a soldier’s last. 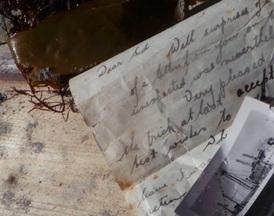 Sometimes curious incidents of fate marked a bottle’s finding:a letter by Private Eric Taylor of Sydney was placed in a bottle and dropped overboard near Fremantle on his sister’s birthday in 1915. Addressed to his parents at Haberfield in N.S.W the bottle was found three years later in East Africa,and the message from there arrived on the sister’s birthday in 1918. (Sunday Times, 6 Jan 1918). A study of recovered bottles and their contents and the purpose and accuracy of their delivery might best answer questions about their meaning, their role in communication and a community belief system challenged by War. Such a study might lead to a collaborative national endeavour to record the story of the Messages from the Sea for inclusion in upcoming WW1 commemorations, and foster another social trust between existing archival and memorial community services. The National Archives of Australia contains digitized soldier’s service records and the National Library of Australia through its TROVE database has significant WW1 newspaper publications that could enable comprehensive study of soldier’s Messages from the Sea.